As you get older, the thought of partying and getting wasted won’t seem too exciting after a stressful day at work. While most people turn to alcohol to find solace amidst the chaos, enjoying a glass of cocktail with your companions can be great for anyone looking to relax and unwind at their favorite restaurant. Since cocktail drinks are basically a mixture of one or more spirits and other ingredients, some customers would want to know what’s in their drink before they order it. This can be relayed by designing designing a menu to showcase the drinks available at the establishment. 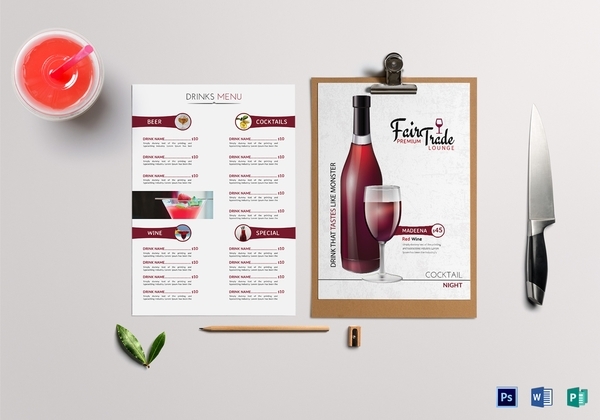 Designing a cocktail menu is extremely easy with the help of the following examples and templates. Pubs and restaurants that cater to wide audiences usually have two separate menus to sell their items. While businesses do have the option to merge their food menu and drink menu together, they are usually separated to discourage underage drinking within the premises. That’s because a drink menu usually contains a variety of alcoholic and non-alcoholic beverages to suit the preferences of their customers. Serving beer, wine, and other cocktail drinks to minors is strictly prohibited and may be punishable by law. Thus, you’d want to make sure you don’t break any boundaries by designing a menu that will cater to your general market. It’s not a party unless you’ve downed a few drinks to give your body that extra burst of energy. 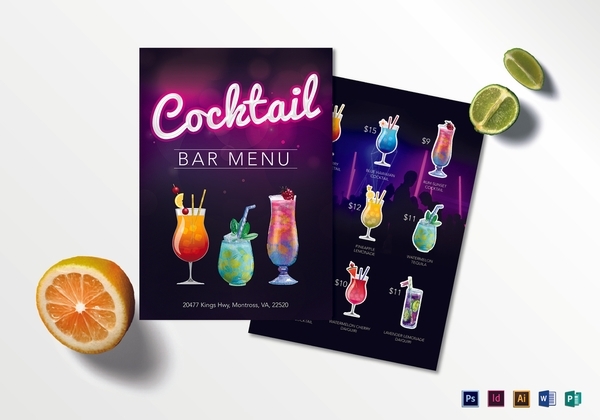 A bar menu often features a variety of colorful drinks and mixes for guests who are looking to try something new for a change. You can even use the menu for guests at your birthday or wedding to make the most out of the open bar. Menus of this type are often more extravagant than usual as a means of enticing alcohol-thirsty individuals with a series of eye-catching concoctions. The key is to add high-quality images of each drink to give customers an idea of what they’re about to order. Labeling menu items with catchy names is also a marketing strategy you might want to apply to give partygoers something to remember from a rather blurry night out. Lying by the beach as you watch the waves crash onto the shore will give you a sense of tranquility unlike any other. Summer is a time for beach parties and other gatherings under the sun that offer attendees a reason to get soaked and tanned as they enjoy a few ice-cold drinks served at the event. The refreshment stand at your party is bound to attract the most people, so make sure that guests know exactly what to order as soon as they get there to avoid holding up the line. 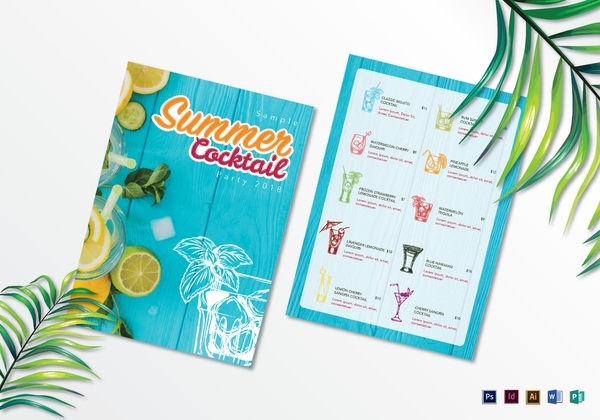 Beach resorts and restaurants typically have chalkboard menus and menu cards to upsell their drinks in the simplest way possible. That being said, feel free to use the template provided to incorporate the season into your cocktail menu with ease. There are many ways to design a cocktail menu, which typically depends on your exact purpose. 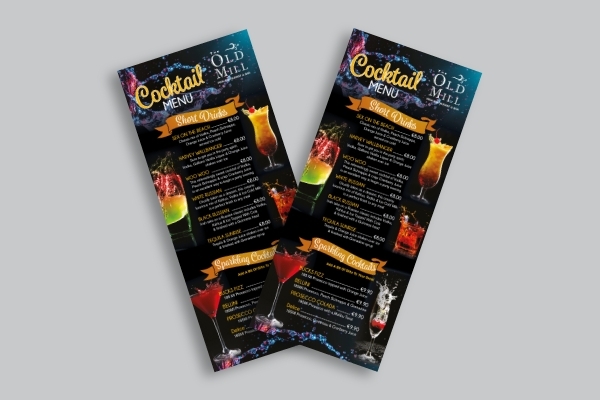 You can design the menu for customers at your restaurant or for guests attending your event. Knowing your purpose will help you determine what you want to achieve with your menu design. Some menus are kept plain and simple, while others are designed with the finest elements to leave a lasting impression with your audience. If it’s your first time to craft a menu, you might want to consider using a template as your basis. Simply edit the pre-made content of the template to meet your professional requirements and personal preferences and you’re good to go! 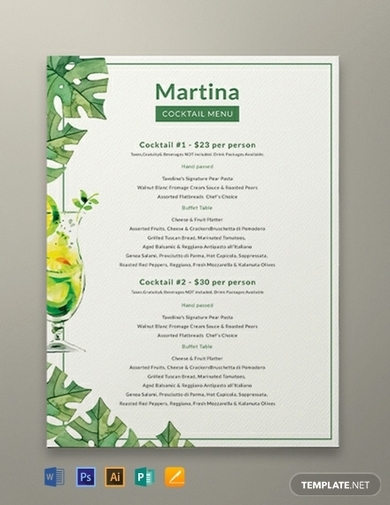 Shown above is an example of a cocktail menu designed by a local bar to market their goods. 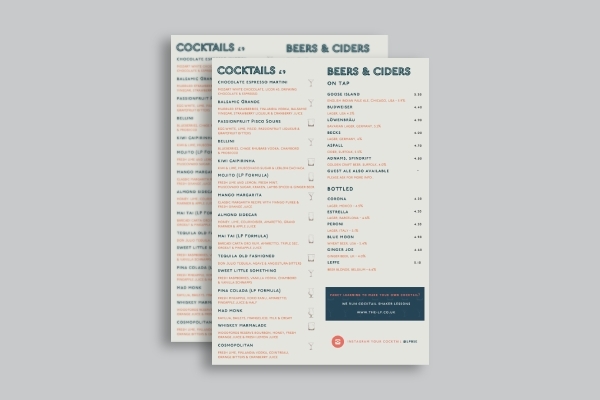 It contains a price list of cocktails, beers, and ciders for customers to choose from. The layout of the menu separates each drink according to their designated categories. This makes it easy for customers to find what they want without browsing the menu for too long. The ingredients mixed in each drink are also included to cater to customers who might suffer from certain food allergies. How many times have you ordered something due to how tempting it looked in the menu? Most of us are guilty of ordering a particular item because of how it was marketed to us by the company. The visual aspect of your menu can easily influence the decisions made by your customers; thus, it’s important to pay close attention to every detail added to the menu to ensure you’re making the right impression. The example above shows how you can get creative with your menu design to encourage customers to order more than what they intended.